My initial contact with Barbara was via the Advanced Certificate in Veterinary Physiotherapy, which I passed with merit in 2011. Attending a few sessions led by Barbara at her centre, K9HS in Suffolk, I was immediately struck by the holistic nature of her approach, her incredible depth of knowledge of small animal anatomy, injury, disease and behaviour, and the amazing results she achieves for her animal patient. When the opportunity arose to apply for an internship at Barbara’s clinic, I applied straight away, despite the fact I lived and worked in London – not an easy commute! I was delighted to be granted the internship and spent 6 months working with Barbara at K9HS. 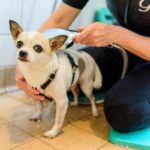 Barbara’s clinic creates a relaxed, calm and therapeutic environment, not only for her owner client and animal patient, but also in which to study and learn. My internship with her was a mixture of hands-on time with complex small animal patients, case discussions, private study time and home study. Barbara’s interactive teaching style encourages you to clinical reason and use your critical thinking skills. Her approach to anatomy is unique – relating form to function and bringing out the “why’s” of anatomy, not just the “where’s”, in a highly academic yet straightforward manner. 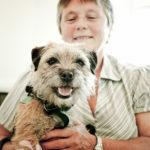 At the centre of her teaching is animal wellbeing – each animal patient is approached with empathy and care, with a constant dialogue between patient and therapist. This approach of working with the animal patient has stayed with me and become fundamental in my own therapeutic approach. My time at K9HS inspired me to raise the level of my own therapy techniques and approach, and I have regularly revisited Barbara at her clinic to update my skills. 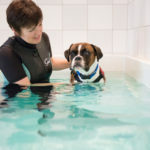 In 2015 I was lucky to find a property in West London and develop my own canine rehabilitation practice, Bach Canine Rehab, with my business partner, Katie O’Brien. Katie also completed a work placement at K9HS with Barbara, meaning our approach to therapy is very similar, allowing for a harmonious professional relationship with patient welfare at its heart. Barbara and I still work closely together and I find her advice and support is invaluable to me in my practice, and her vision for animal therapy vital and inspiring.